I cannot convey to you quite how much I had been looking forward to coming back to Mickfield church. I cycled up the hill from Stonham Aspal, the fields around beginning to get their shimmer of winter barley, and then suddenly there it was, the bulky tower rising above the village rooftops. The St Andrew's flag flying from the top is incongruous at first, slightly shocking even, especially if you have visited several churches proudly displaying the flag of St George on your way here. It's a bit like seeing a single boat displaying the skull and crossbones among a flotilla of others displaying the red ensign. If you did not know about Mickfield church, you might wonder about it. Coming closer, your wonder might increase: a large sign by the roadside tells you that the church is open, and that you are welcome. A driveway takes you down to the west end of the nave, and parts of the graveyard are neatly marked off with domestic fencing; the graveyard behind has been turned into a garden. Everything is neat and tidy, and lovingly cared for. It is as if it is a church in a dream. I opened up the north door, and stepped inside. I had entered a kind of a hallway, with doors off in several directions. A large sign on the noticeboard declared We are sorry that there is no-one here to welcome you. Please do look around the church: there are guide books and Heritage Trail leaflets on your left. Please help yourself to some refreshment in the kitchen if you wish. The kitchen turned out to be straight ahead, the conversion of the south porch. I stepped through. Here was another sign: We are sorry if there is no-one here to offer you hospitality. Do help yourself to a cup of tea or coffee or a soft drink and biscuits. There followed a long list of instructions on where to find everything, which concluded Every blessing on your onward journey! Come again soon! This filled me with an intense delight. I want to tell you about this extraordinary place, but first I must recall my first visit to Mickfield, almost exactly ten years before. How different things were then. At the time, I had only recently started trying to visit all of Suffolk's medieval churches, and I had no idea of what to expect here at Mickfield. I had seen the church marked on the map, and I had read brief accounts of it in Pevsner, Cautley and Arthur Mee. 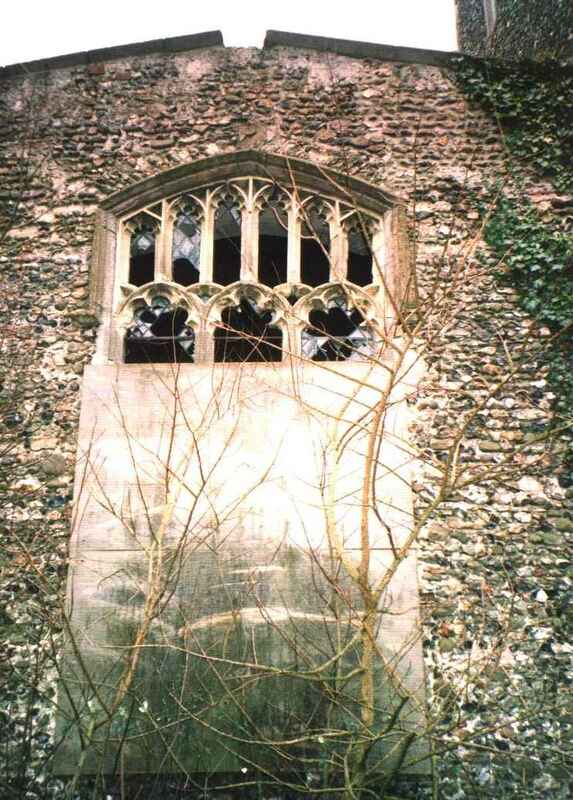 As I came closer, I was shocked to see the broken tracery in the tower windows, the ivy and elder creeping up the masonry. I pushed my bike along an overgrown track, avoiding brambles, rusting cans and other litter. 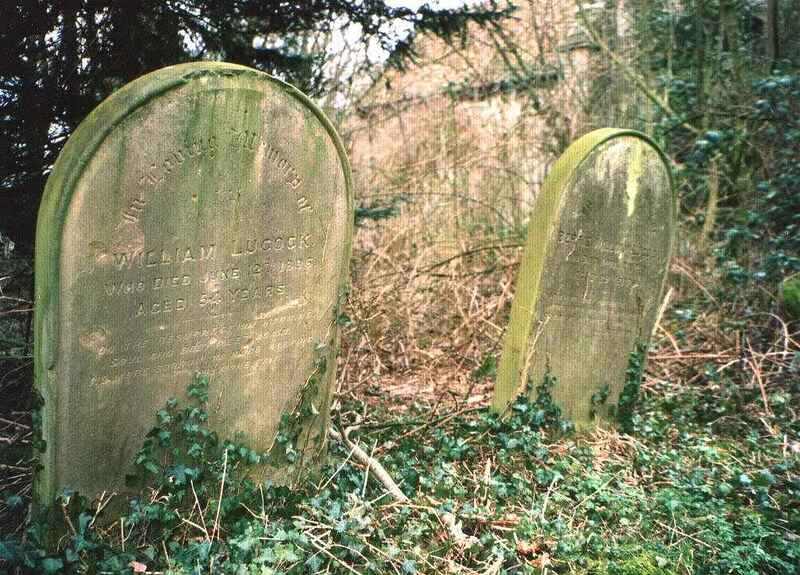 Two gravestones, to a father and son of the Lucock family who died within a few weeks of each other, stood sentinel at the entrance to the churchyard proper. This was overgrown with brambles and nettles, but punctuated by pathways, presumably made by local children. The confusion boiled around what I could now see was a completely derelict church. Although it had been boarded up, some of the boards had been broken down by vandals wanting to get inside. 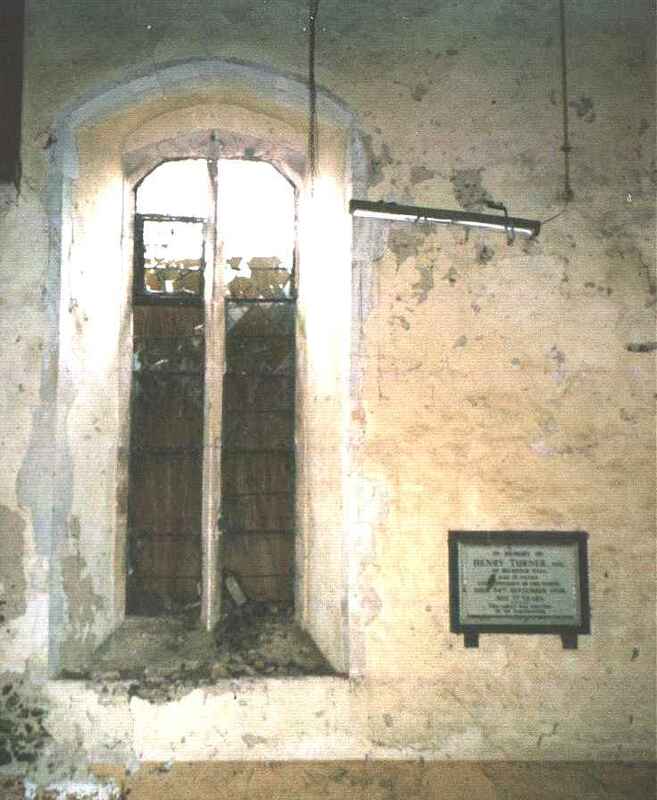 Back in December 1998 it was possible to pick your way through the broken glass, and poke a torch through the hole in the former north door. Inside, nothing remained. The building had been completely stripped of everything - floor tiles, wood panelling, pipes, wiring. All that was left was a stone shell, with an earth floor. The remains of fires were scattered around. It was a vision of desolation. 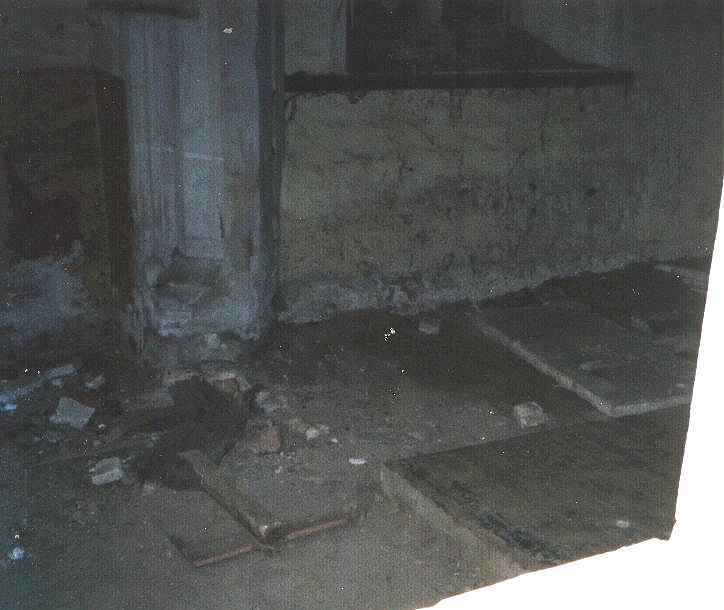 Rubble littered the floor from the tower, now unsafe. It was terrifying. I took some photographs, and, chastened, I hauled my bike back to the road and set off westwards, rather faster than I had arrived. 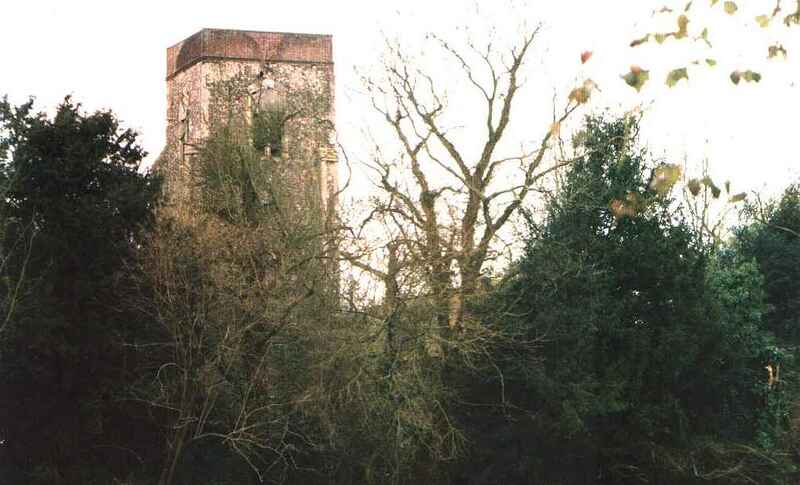 Looking back from the Mendlesham road, the tower appeared unstable, as though groaning under years of neglect. The photographs I took that day, and on a day in February 2003, are to the right and immediately below. What had happened here? 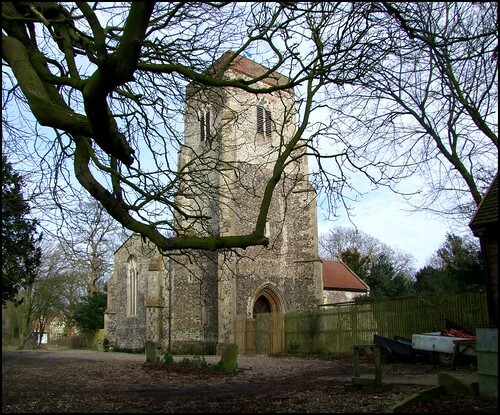 St Andrew, Mickfield, was one of the churches sold off for private use in the 1970s, as part of the Anglican Diocese's ill-conceived plan to rationalise its resources. 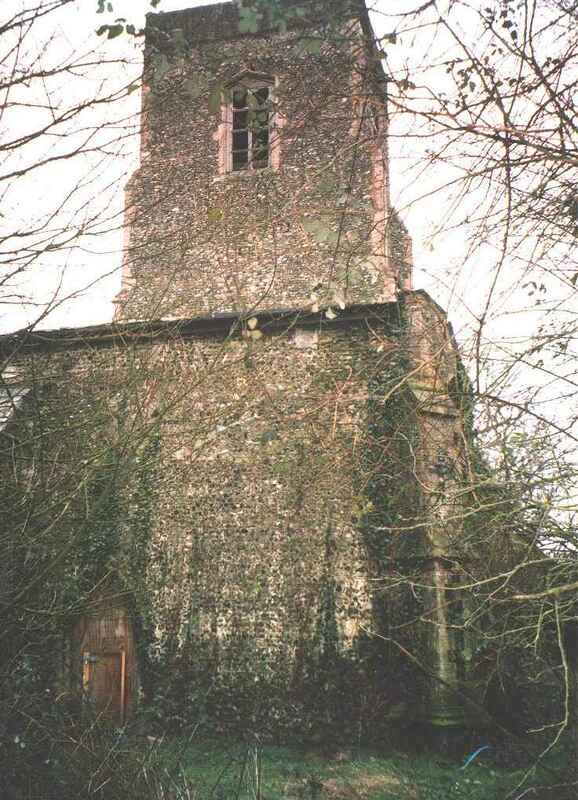 Mickfield is a sizeable village, and the nearest other churches are a couple of miles off, but the main reason seems to have been a hefty repair bill for fixing the unsafe tower. When it was made redundant, the Friends of Friendless Churches offered to take it on. It was a significant building. It had a number of excellent 15th century bench ends, a painted font, a 17th century communion table, brasses of Peter and Thomasine Preston, who died in the early 17th century, brass inscriptions to their son and to his contemporary Francis Dade, and a piscina and windowsill sedilia in the chancel. Incredibly, the Anglican Diocese insisted that the charity pay the market rate for it. Obviously, as a donation-funded body they were unable to do this - and, in any case, as a point of principle it would have been suicidal to do so, opening the way for other greedy Dioceses to take financial advantage of public concern for historic buildings. A furious row ensued. 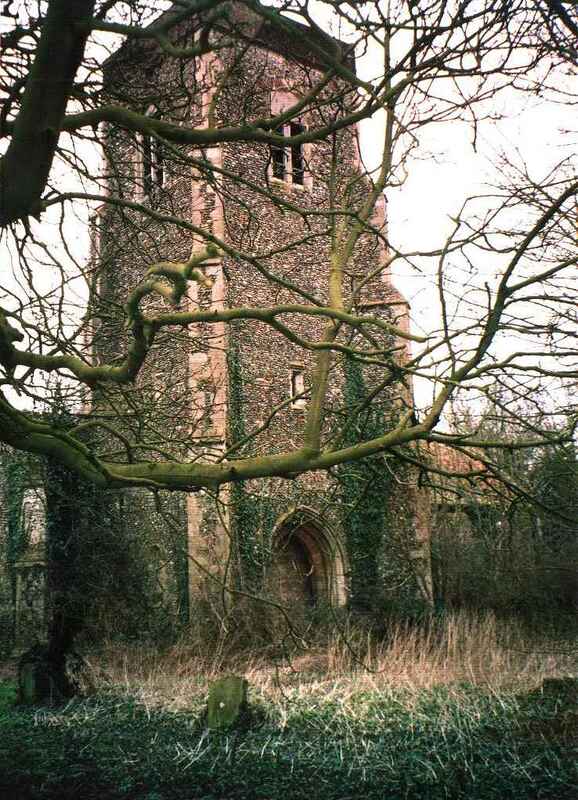 As the church stood locked and decaying, the Redundant Churches Fund became another possible caretaker. Instead, St Andrew was bought by an architect, Tony Rigg, apparently with the intention of converting it into flats. Some of the more valuable furnishings were moved to places of greater safety or sold off. The bell from the tower was removed, and rehung at the pretty church of Boulge. It is worth saying that this probably would not happen today. We live in more enlightened times, and the local Diocese, as with most, has a commitment to keeping village churches going, by grouping them into benefices and giving more authority to local people to manage them. But in 1977, Mickfield church was effectively dispensed with, and so St Andrew waited for its fate, to become just another house, and Mickfield to become a village without a parish church. Other churches in the Diocese went off to the same destiny - Ubbeston, Shipmeadow, Rishangles and Debach among them. But then things started to go wrong. Mr Rigg did not begin work here. During the boom/bust years of the 1980s, he seems to have placed his priorities elsewhere. From Jerusalem where he now lived, he made it clear that he had no plans to do anything with the shell of St Andrew. He even offered to sell it back to the Diocese, at what appeared to be a laughably inflated price, although this was supposedly to cover expenses. The whole thing was a farce of monstrous proportions. It would have made great material for a 19th century novel, a piquant combination of absurdity and despair. I came back four years later. Little had changed. In the village itself, people were doing up their houses, washing their cars, digging their gardens. Children were playing around the remains of a snowman on the village playing field, seemingly oblivious to the bramble-surrounded hulking tower above them. But my heart sunk as I again walked up that track. The walls were even more overgrown, and more glass had been broken. There had apparently been a fire inside at the west end; the lead in the west window was shattered and contorted above the boarding. It was all very depressing. But in fact, even at that moment, plans were being laid to rescue this great building. Local authorities have powers to insist that essential repairs are carried out to buildings perceived to be 'at risk', and in extremis even to make those repairs and then demand payment. There is even a further step which they can take, and this is what happened. In December 1999, Mid-Suffolk District Council prepared a compulsory purchase order on this building. This didn't mean that they were going to buy it themselves - there is no way that, ten years ago, a local authority could have afforded the repair bill. But it would make it easier if an eventual purchaser came along, perhaps someone moving out of London with a lot of money to spend on converting a place in the country. The East Anglian Daily Times, reporting this event, noted that the local authority had sealed up the building up to stop children getting in and causing damage - damage to what, one wondered. Despite its south tower and coloured font, St Andrew was never a beautiful church, being stark and grand rather than pretty. 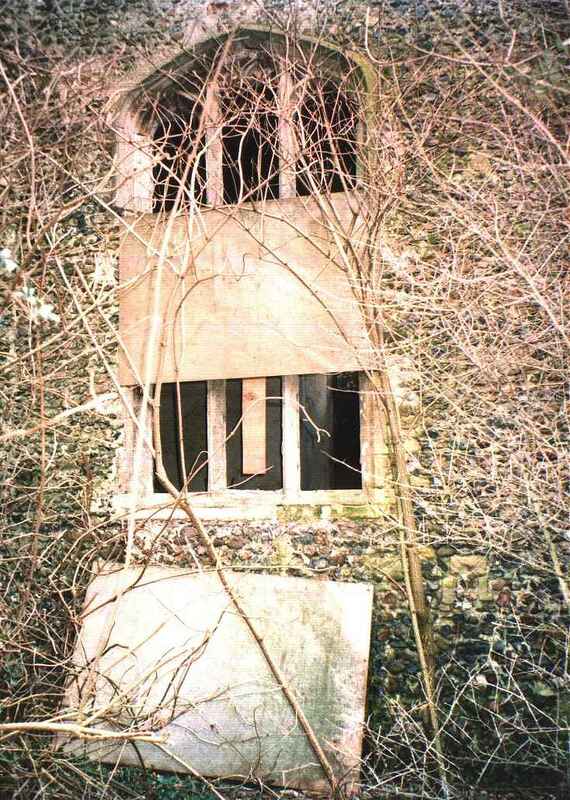 But its dereliction made Mickfield a village without a heart. 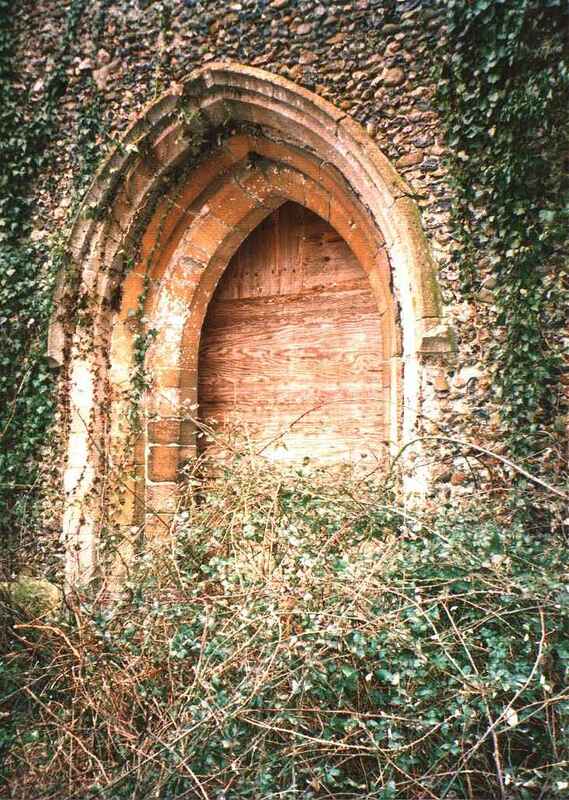 In 1977, when the church was closed, the parish was subsumed into that of Stonham Aspal, to the south. 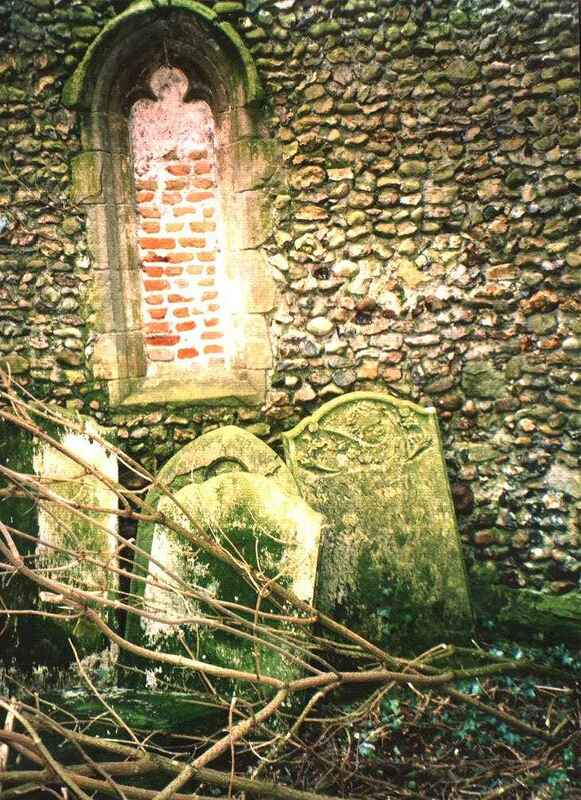 In this part of Suffolk, villages are surprisingly far apart, and the desolation of St Andrew was a grievous one. Seen from the fields on the Mendlesham road, it was a frightening place. In winter, the skeletal trees that separate the graveyard from the cold ploughed fields resounded to the clatter and cawing of black crows busying themselves in their miserable way. 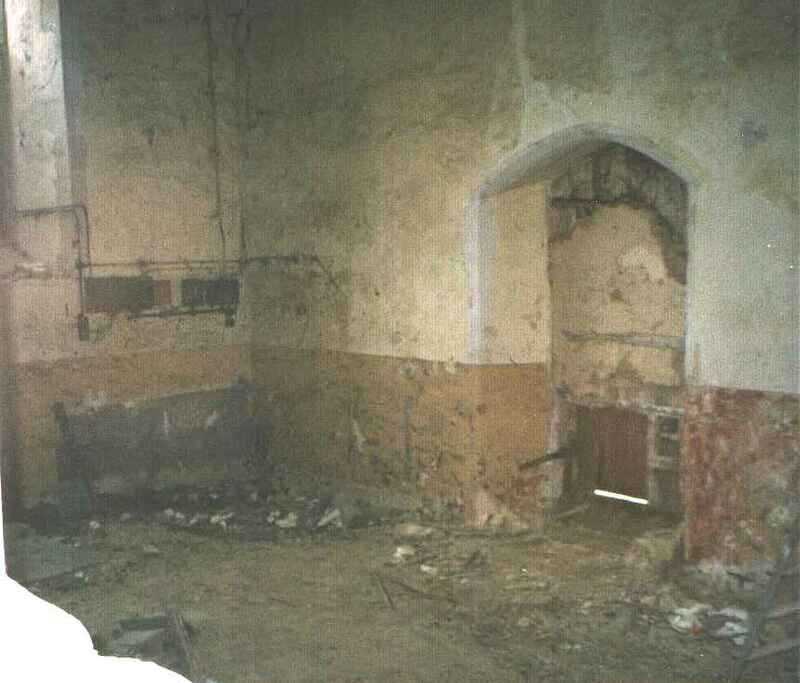 In 2002, I was contacted by someone who claimed to be part of a consortium planning to buy St Andrew and restore it for Christian use as a prayer centre. This was wonderful news, if a little unlikely. To restore St Andrew to its former state would cost many hundreds of thousands of pounds. There seemed to be no future for this building. I observed on this site then that perhaps it was just as well that this sad building should be allowed to gradually decay and collapse. It would be a reminder of the dangers of complacency and short-sighted cost-management. It would serve as a reminder to the Diocese that they have a responsibility to conserve for the future as well as to live in the present. That what we inherit, we do so in trust for generations yet to come. In former times, a disused church would never have been sold off for profit. Instead, the roof would be removed, and as the years passed the building would quietly return to nature. It was ironic then, I observed in 2003, that this seemed to be happening of its own accord at Mickfield. And then, things began to happen very quickly. Ownership of the building was conveyed to the Suffolk Architectural Heritage Trust, which had been set up in 1997 by members of the Suffolk Preservation Society, itself the county branch of the Campaign to Protect Rural England. Its remit was to follow up buildings on the County Council's Buildings at Risk register, take them on, prepare them for a new use, and then convey the building on to new owners. The new use would be selected specifically to ensure that the county's building heritage was maintained. The repairs were carried out with grant aid from English Heritage and also with the help of the Architectural Heritage Fund. While conversion to residential use was not excluded from SAHT's options, that was not to be the case here. Instead, in 2004, ownership was transferred to the Anglia Church Trust (come on, keep up), who reopened the building as 'a Christian centre with training and conference facilities'. That phrase has all the hallmarks of one prepared for a grant application, but in any case St Andrew has turned out to be rather more than this. And so it was, in February 2009, that I stepped into that north doorway, and saw the welcoming notice. I was standing in a passageway which runs north to south across the church, connecting the north doorway with the south porch. Off to the right is an office, a stairway and a lavatory. The roof is low, because the stairway leads to a gallery which takes up about half of the former nave. And, through a doorway on the left, you step into the church. My first impression was of fresh, pastel-coloured light. The body of the nave is separated from the chancel by curtains, and the pink walls and carpeted floor are serene and gentle. It took me a moment to realise exactly why it felt so restful, until I noticed the grandfather clock, solemnly ticking in the south-east corner. The chairs are arranged in a circle, presumably for seminars and other group activities. Somewhat surreally, two large noticeboards on the day of my visit were headed Miracles and The Fall, presumably neither of them refering to the soul and punk bands of those names. Even more surreally, the south-west corner of the nave is taken up with a table, laid for breakfast and with a wide dresser behind it. The balcony extends beyond the doorway, and there is a sense of moving into a wide open space. 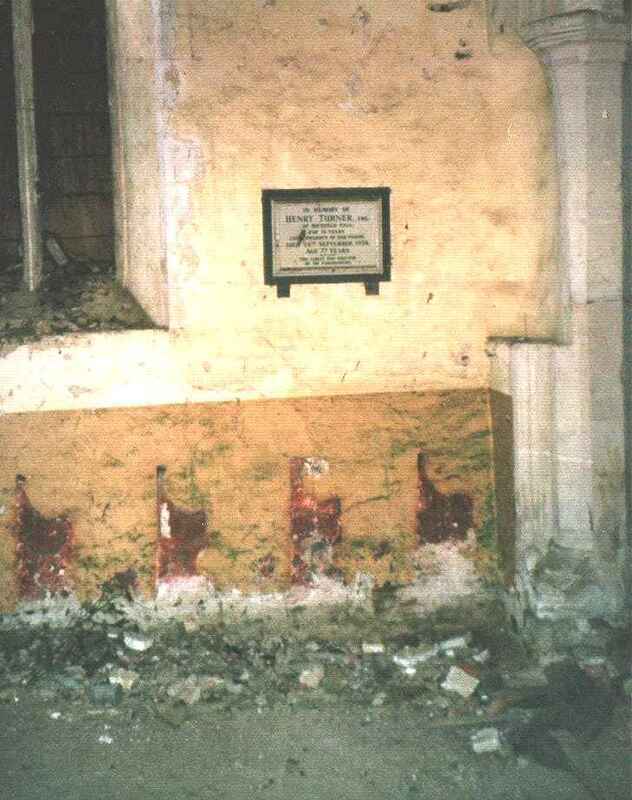 A memorial from the church's previous life survives on the north wall, along with a plaque marking the reopening. I stepped through the curtains into a space which took my breath away. It is simply one of the most beautiful chancel interiors in all East Anglia. It felt a privilege to be here on this beautiful sunny day. Most of the fittings have come, ironically enough, from other redundant churches, mostly in the Chelmsford Diocese, but the two 14th Century pews with their intriguing bench end carvings came from this church originally, They were sold off at the time of redundancy, but have been returned to the church. They were bought for Mickfield from a Norwich antiques dealer by the Cottam Trust, itself an arm of the Friends of Friendless Churches, which gives the story a pleasing symmetry. It should be noted that the centre has no connection with the local Anglican Diocese, although the worship and liturgy appears to be broadly traditionalist Anglican in style, with the use of incense and the Book of Common Prayer. In this we may detect the influence of neighbouring Mendlesham, Suffolk's last thorough-going traditional Anglo-catholic parish church. An ikon of St Andrew sits on the altar, not something you'd find in many Anglican churches, nor many Catholic churches either. Mickfield chancel is host to two acts of public worship every day of the week - again, that's not something you come across very often. I finally managed to drag myself away from the chancel, and wandered back up to the west end, and up the stairs. This brings you up into the mezzanine, so large that it is difficult for a moment to remember you are poised above the western half of a nave. Two 14th Century roof corbels are close enough to touch. The mezzanine has been furnished as a kind of lounge area, I can think of no better word, with sofas and coffee tables. One of the tables was set for afternoon tea, with cups, saucers, a teapot and even a plate of biscuits. And yet all the time I was in the church, and I was in there for more than half an hour, I did not see or hear another soul. It really was like being in a dream. I wandered out through the kitchen, and into the graveyard, now a contemplative garden. Above me, the great tower, at last reprieved of its former misery, stood proudly in the afternoon sun. Incredibly, it has been converted into dormitories. I wandered back into the church, and through into the chancel again. If Mickfield church had not been abandoned, had not been nearly lost to us, had not been rescued and resurrected, how different things would be today! As Eliot reminds us, What might have been is an abstraction remaining a perpetual possibility only in a world of speculation. What might have been and what has been point to one end, which is always present. Footfalls echo in the memory down the passage which we did not take towards the door we never opened into the rose-garden. 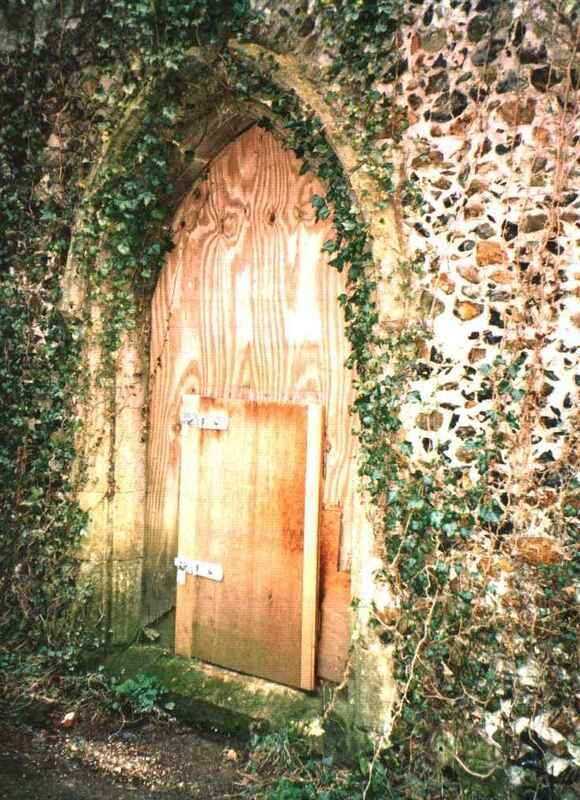 No, this has been Mickfield's destiny, that it would end up one of the most special places for any pilgrim or stranger to visit on their journey through the churches of Suffolk. I spent some time just sitting here in the chancel reflecting. I often do this in churches, as I know many people do, but some churches enchant me more than others, and the sense of eternity with which they fill me is always a good place to let my mind wander. I sat, haunted, thinking of who I had been and what I had been doing when this church was abandoned, and of all the things that have happened since. I imagined this building, a patient, abandoned wreck, sitting here as the seasons turned. I thought of what it might have been like on the day that I had got married some twelve miles away from here - it had been the hottest day of the 20th Century. 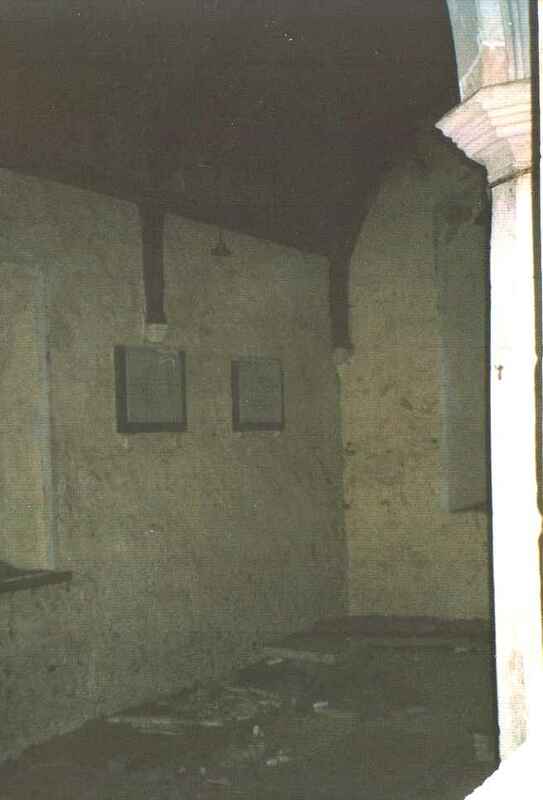 I thought of the births of my children, and other events, sad and happy, private and public, during the long years during which Mickfield church had been left abandoned. And then, that night, I had a dream. I dreamt of a girl I had known almost thirty years ago. I had only known her briefly, and we had spent an afternoon walking around the cold hills west of Sheffield, talking. That was the only occasion on which I remember spending any serious amount of time with her, but here in my dream I saw her perfectly, exactly as she had been, to the last detail. I knew that I had not been happy when I had been with her, and somehow I wanted to reassure her that I had been happy since, that the last thirty years had not been unhappy like that afternoon. In my dream, I awoke, and went downstairs, but the house had changed: it was no longer my house. The rooms were different, the furnishings unfamiliar - but not so unfamiliar, not so much that I did not feel at home. I needed to contact her and let her know that everything was all right, but I could not work out how to find her e-mail address. The consciousness of the passing of time, of those long thirty years, oppressed me, like any perspective opened up down our lives. Thirty years - it's a long time. Around me in the room, the flowers were wilting, and pictures had fallen from the wall. Piles of books and records were covered in dust. I knelt and found a record I knew I'd played her once, and as I stood again, she was there, sitting on the couch, and I knew then that everything was all right. And then I woke up. And as I lay there, I thought of her, but I knew that the dream had really been about Mickfield. I thought back to the day before, and I thought of all the people who had known St Andrew over the centuries as the centre of their community, and as the place where their families had celebrated the mysteries of birth, love and death. I thought then of someone leaving Mickfield in the 1970s, and coming back today to find it as it is now, without knowing what had happened in between. I thought of people living in Mickfield during the second half of the 20th Century, born here and never moving, watching the slow, obscene degredation of their one constant touchstone down the long generations. It would make you want to weep. And at last I thought of St Andrew today, renewed, risen; like Lazarus, back from the dead.